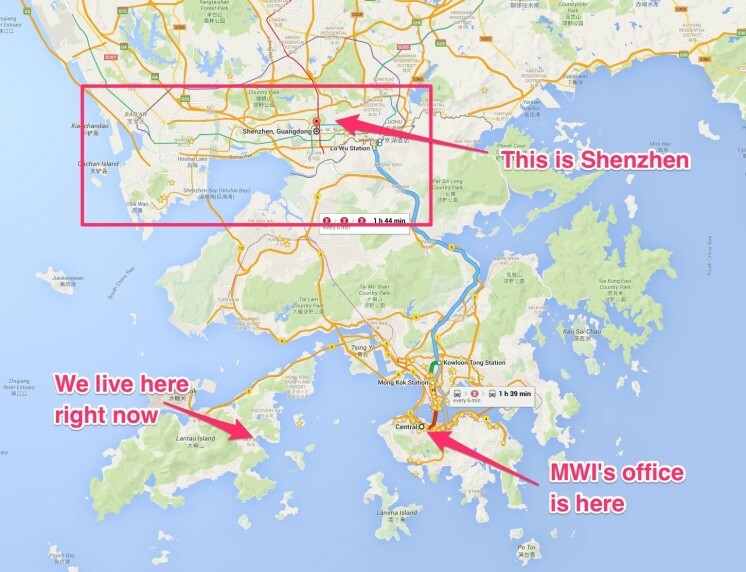 I’m moving to Shenzhen, China to open MWI’s second Asia office there. Why did I choose Shenzhen over Singapore or another Asian market? It wasn’t too long ago I posted about why I wasn’t going to move to China, even though I wanted to. Now I’m in the process of hauling myself and my family to Shenzhen, China — just across the border from Hong Kong where I’ve lived and worked for the past three years. I had originally intended for MWI’s next office to be in Singapore, and was gearing up to move there, but changed my mind. That’s a bit of an understatement, actually. Here’s a map of Shenzhen and Hong Kong. The center of Shenzhen is a little over 30 kilometres (or about 20 miles) from downtown Hong Kong. The other night, the MWI Hong Kong team and I attended a local presentation from a friend of mine who lives in Shenzhen. He messaged me when he got to his home in Shenzhen and it turns out it took him less time to get to his home than it took for me to get to mine. We have other options in Singapore. I do not need to be in Singapore for us to open an office there. We have at least one great prospect for someone who can open the office for us, and even if he weren’t the right fit, we can find others. Singapore has a rich talent pool and we have existing networks there. Within China there is less of that so I can add more value [in Shenzhen]. Shenzhen has a special economic zone called Qianhai where they are actively recruiting companies with incentives like a tax discount and are entertaining a more open internet (see South China Morning Post article on the subject). It is often referred to as ‘the Silicon Valley of China’. The cost of living in Shenzhen is less than in Singapore. Billions vs. millions and just like in Hong Kong there are only a few companies in Shenzhen that do what we do. BTW, I posted this video on slack previously but if you didn’t watch it already you may be more interested now. It’s a recent documentary by Wired about Shenzhen. The original version of this article appeared on Josh Steimle’s website.